Josh Bocatija a.k.a. "Pacquiao" is very thankful for Coach Kory Zuniga and School of Skills staff for being given a chance to be the first official scholar of School of Skills. Josh started his basketball career with school of skills in 4th grade and his participation to the program has developed his skills and ability in the field of basketball. 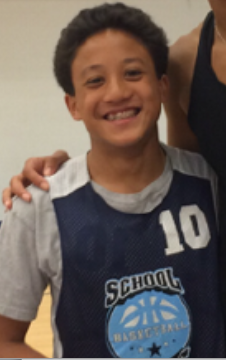 With School of Skills’ guidance and proper training, he became a part of RBYB’s All Star Team from grades 4 to 8. Currently, Josh is in his freshman year at Bishop Montgomery High School and is starting on the Frosh team. His ongoing loyalty, great attitude, leadership ability and GPA of 3.5 has earned Pacquiao a fully sponsored scholarship to Bishop Montgomery for all 4 years. Josh also excels in the field of Chess as he won several competitions in school and Grand Match Gala Chess Tutors. Congratulations Josh!